Now that this baby quilt is in the hands of its recipient (well, her mama, technically since she will not be making her debut for another month), I can share it with you! 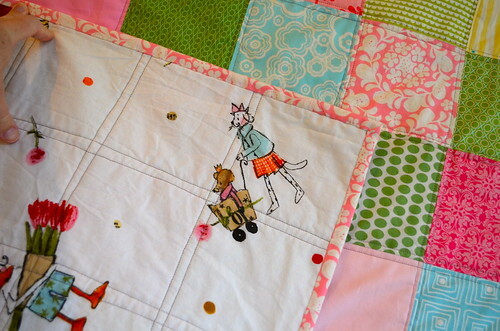 I was thinking of making a baby quilt for my friend when I noticed a lovely pin in my quilt board from Kajsa's blog. It seemed like the perfect way to make a baby quilt. 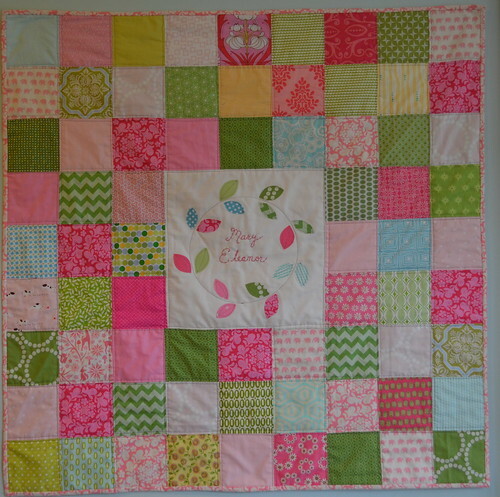 I used 5" charm squares (many of them from rainbow swaps) in pinks and greens with a few yellow and aqua squares thrown in. I made eight nine-patch blocks and one central square in white. The piecing went pretty quickly with the big squares and then I was on to the wreath of leaves and the name (isn't that the sweetest name!). I raw edge appliqued the leaves after securing them with heat n' bond. The name is hand embroidered with perl cotton. I just wrote her name with a frixon pen and did a simple backstitch over it. Then I straight line quilted 1/4" from each ditch. I was so happy this fun ikea print was just a little wider than your normal quilting cotton, so I was able to make the back in just one piece. I do love those Sandi Henderson Henna fabrics, and used the lighter pink one for the binding. I didn't look at any of the photos I took until I tried to edit them just now. I must have taken my photos on a particularly dreary day, I can't get the colors to look quite right. In person, it looks a bit more pastel and babyish. I really should get on my new year's resolution to learn how to use my fancy camera! I did have such a nice time at the baby shower this afternoon. Aren't baby showers so much more fun and wedding showers? The gifts are just so much more exciting! I'd rather see all the cute baby stuff than blenders and everyday dishes any day. The icing on the cake was an ice cream bar at the end with Graeter's Ice Cream - oh, that black raspberry chocolate chip is heaven in a bowl! I just absolutely LOVE it! Rob and I kept looking at it last night. Every detail is beautiful! 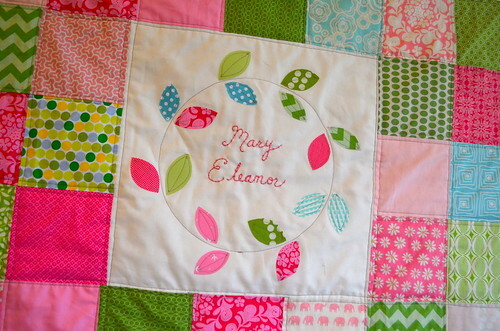 Thank you so much for making such a special gift for us & Mary Eleanor! 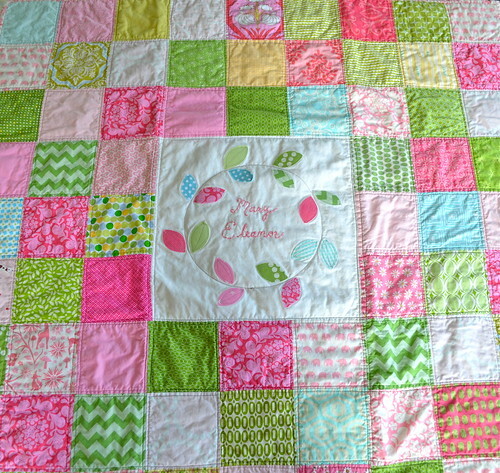 What a very sweet quilt and a lucky recipient. this is so pretty. i love the center and the back. you did a fantastic job. Courtney, it's beautiful. I love that center block!